Martha Stewart's success was founded primarily on her numerous ventures in publishing - a success that continues to this day. Throughout most of the 1980's, Martha was the bestselling author of numerous lifestyle books on cooking, gardening and entertaining topics. She also expanded her writing into magazine publications through a series of columns for The New York Times, House Beautiful (where she was a contributing editor) and many others. In the 1990s, Martha became perhaps the most successful magazine entrepreneur in recent history after the launch of Martha Stewart Living - a publication that eventually led to the creation of her eponymous company. Below is a description of the many magazines that have been published under the Martha Stewart moniker. Some are very successful to this day while others were short-term ventures. All of the magazines below are (or were) available through subscription services. 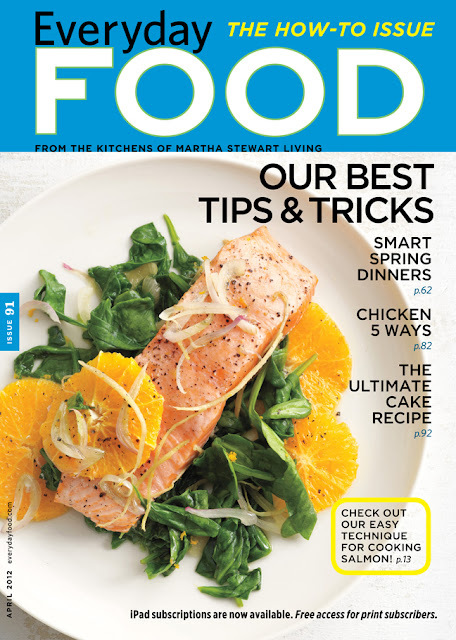 For information about supplemental issues of Martha Stewart Living, please visit the special issue magazines link. For information about international versions of Martha Stewart Living please click here. Martha Stewart launched her first magazine, Martha Stewart Living, in 1990 through Time Warner Inc. to huge success. Issued bimonthly at first, it began publishing 10 times a year in 1993 and then monthly in 2001. 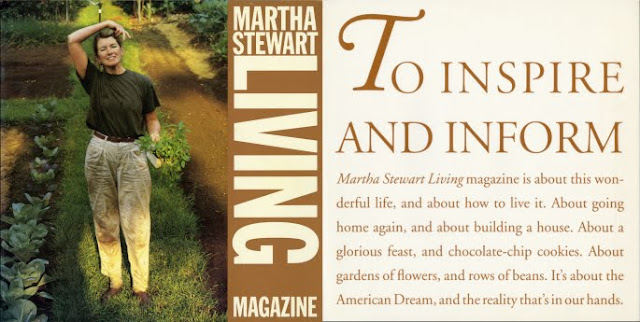 The magazine featured a photograph of Martha on each cover for the first three years of its run and the "how-to" content centered around all aspects of living, as the title suggests: cooking, entertaining, gardening, homekeeping, restoring, collecting, crafts and celebrating holidays. It also featured numerous original recipes in each issue. Much of the content was originally filtered through Martha’s own lifestyle and personality, catering primarily to upper-middle-class women who lived in relatively large homes on relatively large parcels of land. The magazine had a decidedly rural focus with features on farmstead produce and artisinal crafts. Emphasis on the homemade, the hand-crafted and the homegrown were always part of the content. Above: a promotional mailer for Martha Stewart Living that was sent to potential subscribers in 1990. On the back was a space to fill in your address for return to subscription services at Time Warner. The magazine has always boasted beautiful photography (unparalleled in the magazine industry) and a clean, streamlined layout that is pleasing to the eye. Intriguingly large dimensions and high-quality printing techniques give the magazine a luxurious look and feel. The content is well researched and always relevant to the magazine’s mandate of inspirational living on the North American continent. It has inspired countless competitors, such as the derivative Real Simple, which emulates Martha Stewart Living in numerous stylistic ways. Other celebrity magazines have borrowed heavily from the successful design of Martha Stewart Living, such as O magazine (Oprah Winfrey’s monthly magazine) and Rosie, Rosie O’Donnell’s now-defunct magazine. 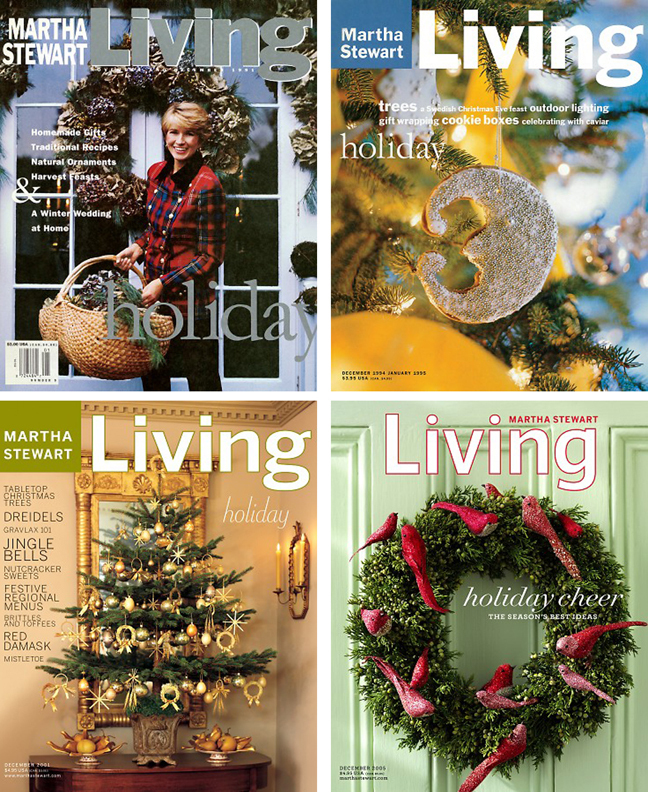 Martha Stewart Living also helped to boost the sales of similar home and garden magazines, essentially raising the bar on the standard of presentation these shelter publications sought to employ. Martha was able to revitalize the home/lifestyle sector of magazine publication across the board by elevating the importance of lifestyle topics and popularizing them through her growing celebrity. Martha Stewart Living was named "Magazine of the Year" by Ad Age in 2007 and has consistently been named among the Top 10 Magazines by Adweek each year. It has also received the Matrix Award in the magazine category and has won the National Magazine Award three times in design and content categories. 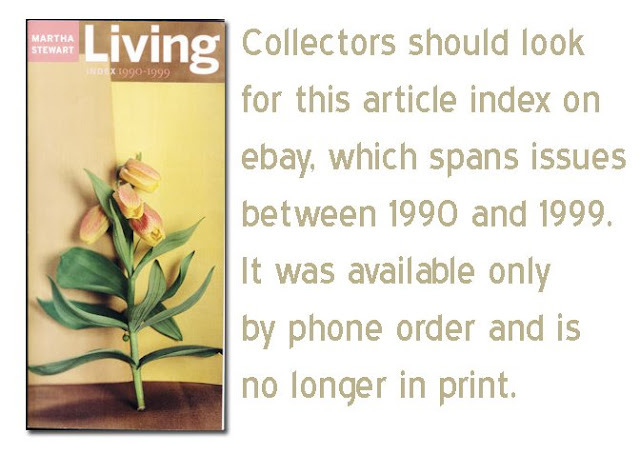 By 1997, Martha had bought back her magazine from Time Warner Inc. and subtle changes to the design and content ensued. Martha began to distance herself slightly from the subject matter at hand, although she still maintained a brand-conscious presence. Several columns in each issue, including "Martha’s Calendar", "Ask Martha", "A Letter from Martha" and "Remembering," ensured that Martha's personality was firmly entrenched in the magazine's mandate. Regular features on Martha's personal residences, gardens and parties also appeared. In 2004, when Martha was sent to prison, her company opted to downsize its founder's name on the cover of each issue with a newly designed masthead that stressed the word "Living." MSLO also removed all of the content Martha once provided in its pages, as well as all photographs of her in the articles and ads. This move was taken to appease concerned advertisers who feared a tarnished image, but many readers found these measures to be too drastic and extreme. In these examples of past December issues, you can see the evolution of the cover design. Top left: Martha's name is capitalized next to the title. Top right: In 1992 a colour block was introduced to highlight her name, which was now lower-case with capital initials. Bottom left: The title font is refined and Martha's name is capitalized again. Botton right: In 2004, Martha's name was downsized on the cover of the magazine due to her legal troubles. The new layout shows Martha's name printed in smaller font above the title, which was also redesigned in new font and centered on the cover after the removal of the colour block. While the new front-cover design remains the same today, Martha's content has returned since her release from prison in 2005. The "Ask Martha" column is back and a new column called "From Martha" authored by Martha can be found at the beginning of each issue. Even "Martha's Calendar" is back in the fold. Martha Stewart Weddings began as a supplemental special issue for Martha Stewart Living in the fall of 1995. Filled with ideas for the bride regarding all areas of wedding planning, the magazine went on to publish as its own entity in 1999 and is currently issued quarterly, centered on seasonal wedding themes and ideas. Like all of Martha's publications, Martha Stewart Weddings contains exquisite photography and timeless information that is inspiring to a bride who demands excellence and quality. There are no tips for cutting corners here, although practical articles about maintaining a budget and overcoming the stress of organizing a wedding are usually part of the parcel. Examples of exceptional cakes, delightful gowns, beautiful stationery, fantastic flowers and a plethora of ideas for wedding decorations and favors form the bulk of the magazine's glossy layout, demonstrating a creatively edited elegance versus the flashy oppulence found in other wedding magazines. Each issue also contains true wedding stories, a review of honeymoon destinations, 'Good Things' and a handy, detatchable wedding planner that includes a seating chart. 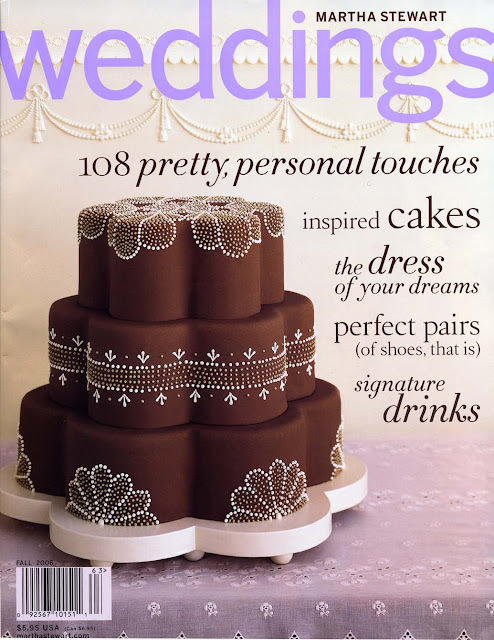 Weddings has celebrated 10 years on the newsstands and it is one of the most successful and influential publictions on its subject. For a period of two years beginning in the fall of 2000, Martha Stewart Living released a series of seven special issues devoted to babies. 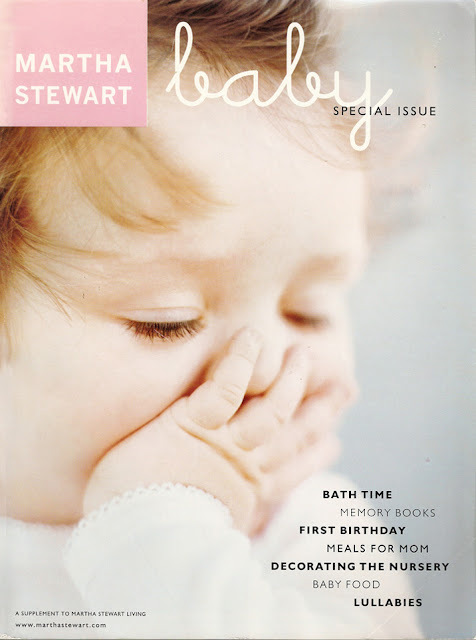 Titled Martha Stewart Baby, the publication featured advice for expecting and new mothers about how to care for babies and toddlers. With tips on decorating a nursery, throwing a baby shower, crafting unique gifts, making scrapbooks and taking photographs of children (among many other topics) the magazine was a beautiful example of how every area of life can be beautified and lovingly tended to. The magazine published its last issue in September, 2002. Click here to read more about Martha Stewart Baby. Later titled "Kids: Fun Stuff To Do Together", this beautiful, informative and creative magazine, which launched in 2001, went on to become one of the most acclaimed in its field. It was issued six times a year at first and then had its circulation cut to quarterly status in 2004. Original issues also contained a Letter from Martha. Filled with wonderful photography and imaginative craft ideas, Kids won numerous awards, including the National Magazine Award for best design in 2005. It was also named Magazine of the Year by the society of Publication Designers in 2004. Its layout is spectacular and filled with information for both parents and kids regarding all manner of topics, from pets to science to nature to cooking to crafting to sports to parties to games - and on and on it goes! The magazine contains recipes, craft workbooks and a very unique "How-Now" section, which forms a detatchable booklet for the young reader. The section usually focuses on an animal, be it pigs or cows or scorpions or bats, and the activities in the booklet (mazes, word games, jokes and puzzles) center around this theme. Kids published its last issue with the Spring 2006 edition. 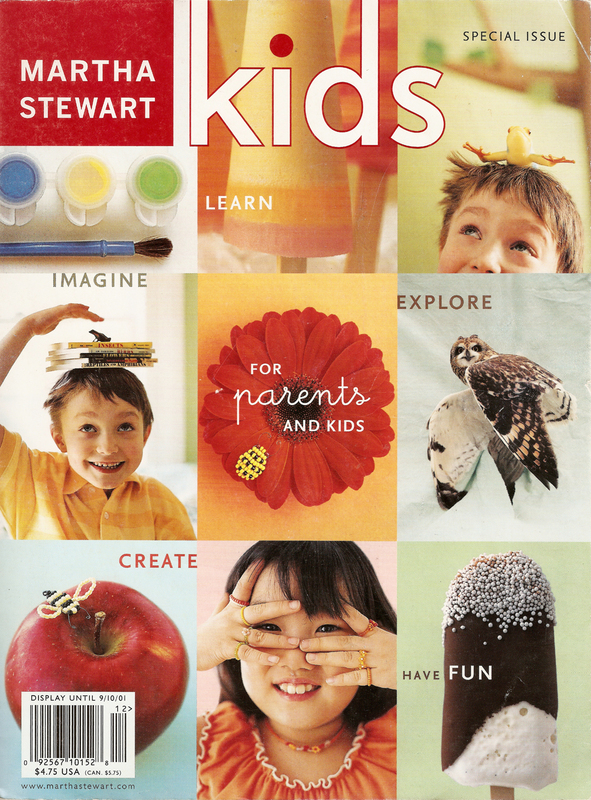 Click here to read more about Martha Stewart Kids. This magazine launched in the winter of 2003 and was an instant hit with readers. Its diminutive digest size makes it easy to use in the kitchen, drop into your purse to take it to the grocery store or take to a friend's place to share a fast-and-easy recipe. "Fast and easy" were key words for Everyday Food. Inside, the recipes all centered around ingredients that could be easily purchased at the grocery store and usually cooked in less than an hour. It was marketed to two primary demographics: the busy mom with a busy family as well as the new, young cook who is just starting to learn the ins and outs of basic cookery. 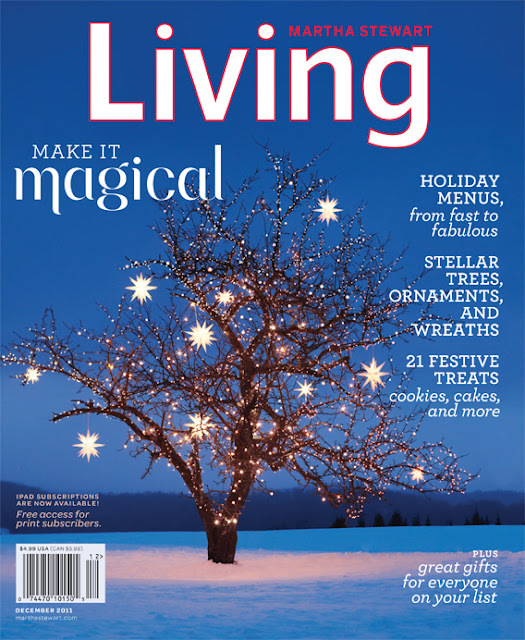 Due to a lag in sales, the magazine published its last issue in December, 2012, and began to issue periodically as a supplement to Martha Stewart Living subscriptions. These supplemental issues ceased publication in January, 2014. Along with the delicious and easy recipes, which formed the bulk of the magazine, were brief articles on wine, tips for picking good kitchen utensils, nutrition facts and some easy preparation techniques. It has a 'back-to-basics' feel about it, but it is still able to inspire with beautiful photography. In fact, the monthly magazine was so inspiring that a new television series was developed by MSLO Television for PBS based on the magazine's quick and easy recipes. Its hosts are the magazine's contributors. 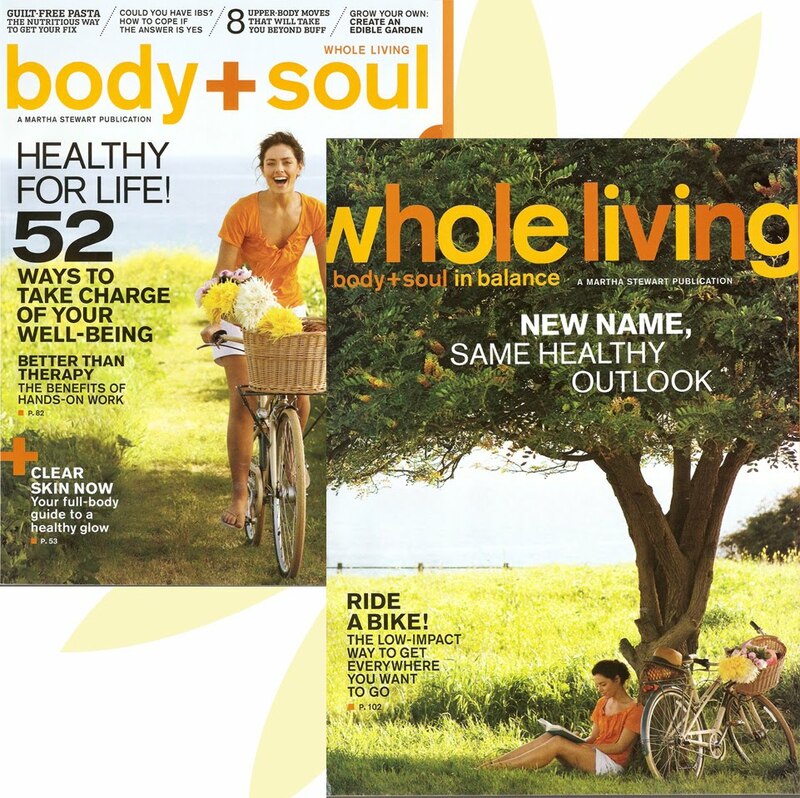 In 2005 Martha Stewart Living Omnimedia announced the acquisition of Body + Soul magazine, a Boston-based new-age publication about self-healing, spirituality, healthy living and exercise. While the core content of the magazine did not change with the acquisition by MSLO, the look and design of the magazine did. As the new publishers, the design team at MSLO took a lean, spare approach to the new layout and brought a higher standard of photography to its pages. Editors and writers at the magazine worked primarily separate from Martha Stewart Living. The magazine also had its own accounting services. MSL published, advertised and distributed Body + Soul. It published 10 times a year. Body + Soul was honored with a 2008 Gold Eddie Award for editorial excellence from Folio magazine for its September issue that year. In June, 2010, the magazine changed its name to Whole Living to better parlay with the 'Living' brand at MSLO. Aside from the name change, the magazine was tweaked slightly with subtle design changes. Body + Soul published its last issue in December, 2012, due to a lag in sales. In 2006, MSLO announced the launch of its newest publication - one geared to the 25-year-old to 35-year-old demographic of first-time apartment-dwellers and homeowners. 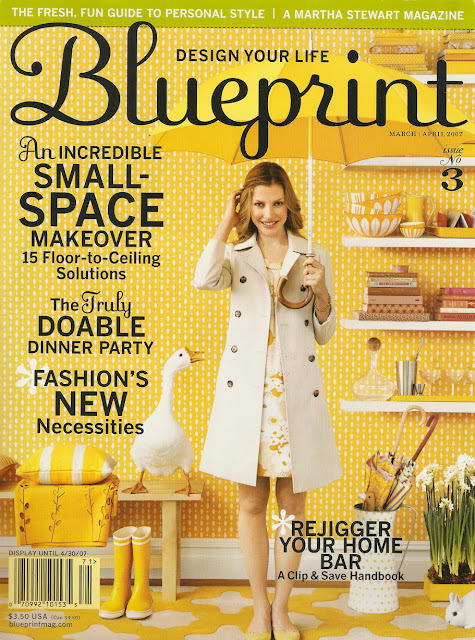 With a fresh-faced editorial and design staff, Blueprint published twice in 2006 and published six more issues in 2007. The magazine covered similar topics to Martha Stewart Living but with a younger person in mind. There were articles on decorating, gardening, entertaining and cooking with a more edgy brand of delivery. Additionally, there were buying guides and product details for the consumer-oriented readers. 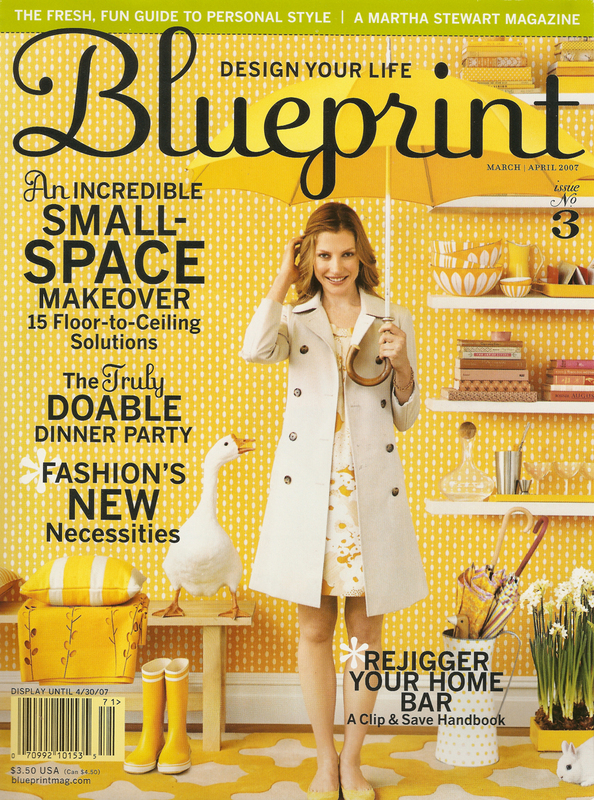 Sadly, Blueprint ceased publication with its February, 2008, issue. Click here to read more about Blueprint. Do you know what happened to Sarah Humphreys, the editor of Blueprint? I loved loved loved that magazine. I'm not sure where Sarah Humphreys went. I know she's no longer with MSLO, but I'll have to find out where she went to. Every now and then I google her, but no luck. I'd buy her next magazine/book/project/whatever in a heartbeat. how crazy am I to hold on to my old (and new) magazines ? I love them until I realize my shelf space is fading fast . . .